Kumite 1 League is held tonight (September 29) at Dome at NSCI SVP Stadium in Mumbai. The inaugural event features a live scoring MMA competition between teams India and UAE. 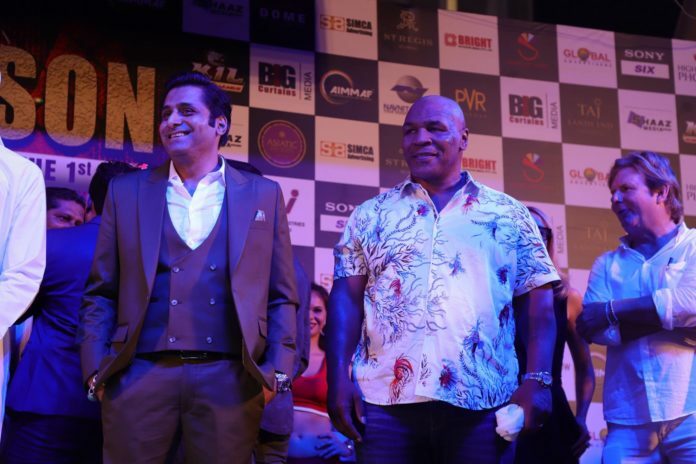 Former undisputed heavyweight world champion Mike Tyson attends the event as a special guest. The official launch and press conference was conducted on Friday. When asked about his thoughts about the concept of Kumite 1 League, Iron Mike said “it’s awesome”. Among everything, talking the most difficult opponents he faced inside the square circle over the course of his career as a professional boxer, Tyson said there were “sure quite a few”. He named “really tough fighters” Lennox Lewis, Evander Holyfield, Donovan “Razor” Ruddock, Buster Douglas. He has also weighed-in the current heavyweights Tyson Fury, Deontay Wilder and Anthony Joshua, with the latter being on top of the list. When asked if a boxing matchup between Floyd Mayweather and Conor McGregor was “something credible” for him, Tyson said that it was a good fight and he was entertained. The main card at Kumite 1 League comprises six bouts follow a five-fight preliminary card. The lineup can be found below.